Durian season is upon us in Cambodia. You can find durian in BKK1 market, o’russey, toul toam poung, or pretty much any market! Most people know of it as a smelly fruit, but it is much more then that. Kampot durian is known to be one of the worlds best (it costs two times as much a thai durian). Kampot even has a durian monument! 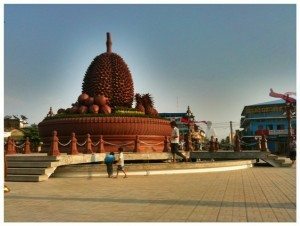 The word durian can be pronounced in Khmer as thouren or written in Khmer as ធូរេន. The fruit is very tasty, I highly recommend you try one! It looks like it has brown spikes on the outside with a greenish skin, and inside is a creamy yellow stuff. If trying fresh durian isn’t that great, try durian ice cream or rice with durian and coconut milk…They even have durian chips!